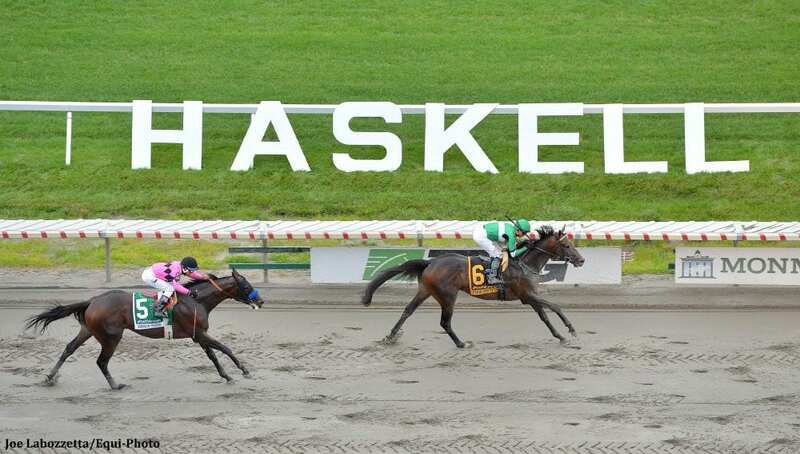 Led by Grade 1 Preakness and Haskell Invitational winner Exaggerator and the 1-2 finishers in the Grade 1 Belmont Stakes, Creator and Destin, a total of 22 3-year-olds were nominated to the 147th running of the Grade 1, $1.25 million Travers on August 27 at Saratoga Race Course. Exaggerator, who as a 2-year-old won the Grade 2 Saratoga Special for Big Chief Racing, has three Grade 1 victories on his resume this year, including the Santa Anita Derby, along with a late-running second to Nyquist in the Grade 1 Kentucky Derby. Chad Brown, currently the leading trainer at Saratoga, has three nominated to the 1 ¼-mile Travers: Sheep Pond Partners' My Man Sam, beaten a neck as the favorite facing older horses in an allowance on July 23 at Saratoga; Paul Pompa's Connect, and W. S. Farish's Gift Box, who were first and second in the Curlin on July 29. Forever d'Oro, third in the Curlin, also was nominated along with stablemate Seeking Blame from owner Charles Fipke and trainer Dallas Stewart. The Grade 2, $600,000 Jim Dandy, the traditional local prep for the Travers, yielded three nominees in addition to Creator, who was sixth, and the Todd Pletcher-trained Destin, who was third: upset winner Laoban from trainer Eric Guillot and Southern Equine Stables, runner-up Governor Malibu, trained by Christophe Clement for Jump Sucker Stable and Mohaymen, who finished fourth as the favorite for trainer Kiaran McLaughlin and Shadwell Stable. Along with WinStar Farm's Creator, newly minted Hall of Fame trainer Steve Asmussen has nominated multiple graded stakes winner Gun Runner, most recently fifth in the Haskell for Winchell Thoroughbreds, and Gettysburg, who set the pace in the Belmont and faded to finish eighth for WinStar Farm. Hall of Fame trainer Bob Baffert, whose Triple Crown winner American Pharoah was upset by Keen Ice in last year's “Mid-Summer Derby,” will be represented by Haskell runner-up American Freedom, owned by Gary and Mary West and Arrogate, winner of three straight in California for Juddmonte Farm. Rounding out the nominees are Whateverybodywants and Anaximandros, second and fourth, respectively, last time out in the Grade 2 West Virginia Derby; New York Derby winner Hit It Once More; Majesto, sixth in the Curlin; Ohio Derby winner Mo Tom, and two from trainer Rudy Rodriguez: Summer Revolution, 2-for-2 this year, and Voluntario, most recently fourth in the Grade 3 Dwyer at Belmont. The Grade 1 Travers is the centerpiece of a blockbuster card that include five other Grade 1's: the $1 million Longines Sword Dancer, the $750,000 Personal Ensign the $500,000 Ballerina, the $500,000 Ketel One King's Bishop, and the $700,000 Priority One Forego, along with the Grade 2, $400,000 Woodford Reserve Ballston Spa, in which undefeated Grade 1 winner Lady Eli is expected to make her return to racing. This entry was posted in Racing and tagged american freedom, arrogate, connect, creator, destin, exaggerator, forever d'oro, gettysburg, gift box, gun runner, majesto, mo tom, my man sam, saratoga, seeking blame, travers by NYRA Press Office. Bookmark the permalink.